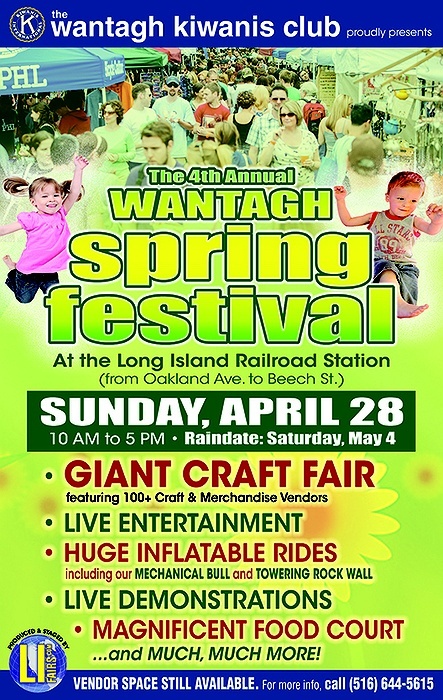 Subject: LongIsland.com - Your Name sent you Event details of "The Wantagh Spring Festival"
The Annual Wantagh Spring Festival returns on Sunday, April 28, from 10 am to 5 pm. This huge quarter-mile-long event will once again take place at the Wantagh Station along Sunrise Highway, from Oakland Avenue to Beech Street. Features inched a large 100-plus vendor CRAFT FAIR, a magnificent FOOD COURT, GIANT INFLATABLE RIDES, Musical ENTERTAINMENT and MORE. Admission is free. VENDORS wanted. Rain date is Saturday, May 4. For more information, call (516) 644-5615.